This page will be a continual work in progress. Check back often for Common Core aligned activities and resources. Click on the links below for activities and resources! Battle of the Books - Make Reading Fun!! 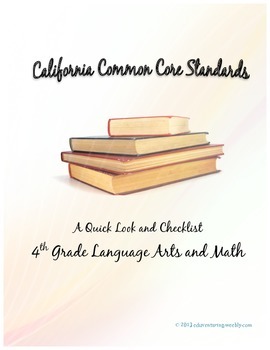 Click the picture below for a Kid Friendly Common Core ELA and Math Checklists! Definitely check out this teacherspayteachers.com author. She is brilliant. In all of my years of teaching I have never come across a resource quite like this. She is creating Common Core aligned resources that pair up with great novels. I have used a few of her resources in class and can highly recommend them all! For any California 4th grade teachers out there, check out her resources on By the Great Horn Spoon!